Krzystof Charamsa: Vatican priest comes out, is quickly fired. Monsignor Krzysztof Charamsa and his boyfriend Eduard talk to reporters in Rome on Oct. 3, 2015. Scandal rocked the Holy See on Saturday as a Vatican priest came out as gay in a very public way, just as Church leaders arrived in Rome for a synod of bishops who will discuss family issues. 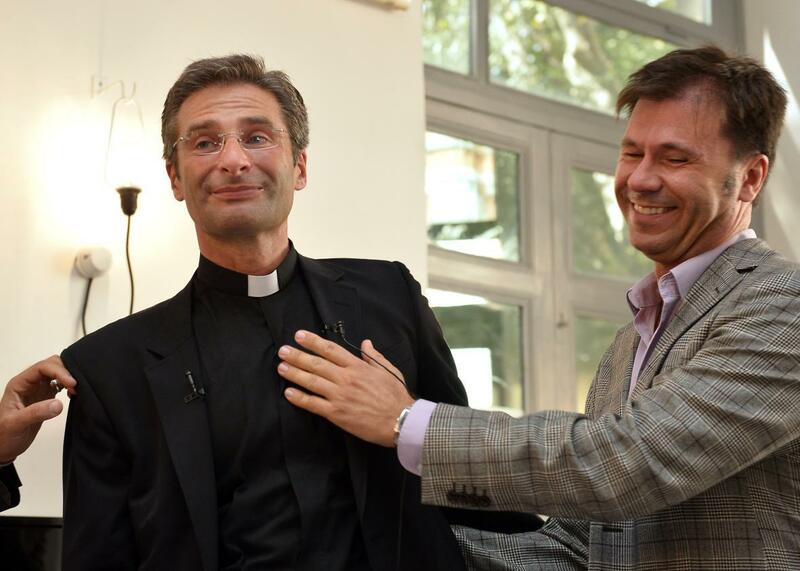 Monsignor Krzysztof Charamsa gave interviews to Italian and Polish newspapers saying he was a happy and proud gay priest and that he was in love with a man whom he described as his boyfriend. The Vatican quickly fired the man who worked as a mid-level official in its doctrine office, reports the Associated Press. “I have to say who I am. I am a gay priest. I am a happy and proud gay priest,” he told Gazeta Wyborcza. Charamsa, 43, later held a news conference at a restaurant in Rome accompanied by his partner, who is Spanish, and gay activists, reports Reuters. In the interview with Corriere della Sera, Charamsa said his partner “helped me transform my fears into the power of love.” He also said he has written a book about his experience. “I came out. This is a very personal, difficult and tough decision in the Catholic church’s homophobic world,” Charamsa said. The Vatican did not comment on the priest’s revelations but said he had to be fired because his actions were “very serious and irresponsible” and appeared to seek to influence the long-awaited synod. “Notwithstanding the respect due to the events and personal situations, and reflections on the issue, the decision to make such a pointed statement on the eve of the opening of the Synod appears very serious and irresponsible, since it aims to subject the Synod assembly to undue media pressure,” Vatican spokesman Federico Lombardi said. Although Charamsa was fired from the Vatican and its pontifical universities, he still remains a priest. That could quickly change. “Other aspects of his situation shall remain the competence of his diocesan Ordinary,” Lombardi said.